PARTICIPANT COUNTRIES: Chinese Taipei, China, Hong Kong China, New Zealand, Thailand and Sri Lanka. This tournament functions as a qualification for the U21 World Korfball Championship 2020 in Chinese Taipei. Which positions in the final ranking equal qualification will be announced later. The games can be followed through the live scores on worldkorfball.sport. 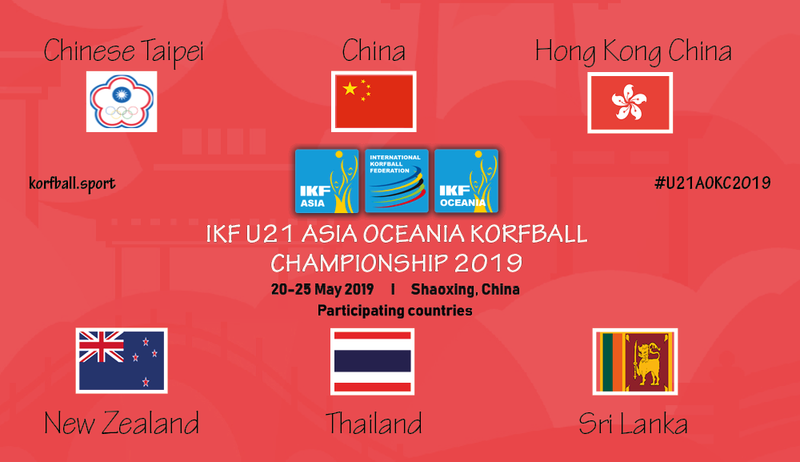 From 20 to 25 May the IKF U21 Asia Oceania Korfball Championship (AOKC) is being held in Shaoxing, China. Today, the IKF announces the countries who will be participating in Shaoxing. This tournament functions as a qualification for the IKF U21 World Korfball Championship 2020 in Chinese Taipei. Which positions in the final ranking equal qualification will be announced later.